I'm heading to Denver today for a 3-day session of simulator flying, lovingly referred to as "You Bet Your Job" by those of us that fly for a living. . . When I get back, if the UPS tracking system is to be believed, my Avax XC2 will be waiting for me. You may have noticed (or not) a cool new feed I've placed on my blog. It's a nice daily feed of paragliding photos that are of good quality. Rod Bailey, a British pilot who (apparently) had some time on his hands & a dream, has put together a system that will allow those of us who like to look at purdy pictures of PG (like me) and allow charitable folks who take purdy pictures to upload them to the server that automatically resizes & serves them out. A good idea that only needs the grist of good photos to survive. Check out pPIC and upload your quality photos. I hope to fly the Avax XC2 over the weekend & will report on it when I get something to report. I've been reinvigorated by the Australia trip. Even though I had a dismal result, (39th out of 65) I did get to goal & set a PR of 71 miles on the last task. The flying we had this Jan. & Feb. will jump-start my season. I think my Avax XC2 (arrives next week!) will give me the performance to score well if I make good decisions in the upcoming XC season. . . I'll be flying the West Coast Paragliding Championships in Ruch, Oregon the week of June 8-14, 2008. I'd LIKE to fly the Rat Race, also at Woodrat Mtn. in Ruch, Oregon the week of July 6-12, 2008; and the Chelan XC Open, in Chelan WA. July 28th-Aug 2nd. I don't have the time off yet for those comps. I'm also planning to fly the U.S. Nationals in the Owens Valley Sept. 14-20. In addition, I'll be flying as many of the Northern CA XC League (Jug comps) as I can this summer. 'Been back from Australia for a couple days now and I thought a recap was in order. The trip started off with my complete PG rig & suitcase missing the flight to Sydney. This was a minor set-back & fortunately the Killarney weather wasn't flyable while David & I drove the 7 hour round-trip to Brisbane to pick up the bags. The Killarney comp was well run & the air of "no worries" was a welcome feeling. David & I didn't fly our best early in the comp. I'm assuming that it was because we are coming off a few months of low air-time during the Northern hemisphere winter. . . I was able to complete the last task of the competition 114k (71 miles) and felt much more comfortable flying the aussie conditions on that flight. The weather was more flat-land with low cloudbase than I fly usually in CA & OR. It was a great experience to watch the locals tear these conditions up. Manilla was experiencing a stationary trough for much of the time we were in town, but we were able to get a few sledders and one XC flight. The countryside in both areas was beautiful & friendly, the people were welcoming & eager to give rides and generously offer a "shout" in the pubs. In all I flew over 300 kilometers and 15 hours. I was able to set a PB at 71 miles and, most importantly, David & I discovered one of the best places to fly PG in the world. We made some great friends. We look forward to revisiting Australia. It was a great trip but being home is great too. After three days in Manilla, with only a couple of very short flights, Dave and I had a treat today. The skies were dry & the winds calm when we woke. The forecast was for light winds and no overdevelopement until late afternoon. We launched arount 12:30 and both had nice climbs to cloudbase (low at only about 1200 meters) I enjoyed the flying near the clouds since we seldom get to do that in California. I worked down the ridge until reaching just North of Manilla and went looking for some more lift. I got low in shadow & went for one of the few dry looking fields in the basin. I stayed with very light lift until it bloomed into a nice weak climb to 1200 meters & petered out. This gave me enough altitude to head up the main Manilla road. I ended up well West of the main road in the foothills & eventually landed in a nice field. I only covered 22 kilometers, but the 1:45 flight was fun. My hike-out was 3.6 miles to the main road where, before I'd even set my bag down, I got a ride into town. Dave called my phone & said he'd pick me up in town. 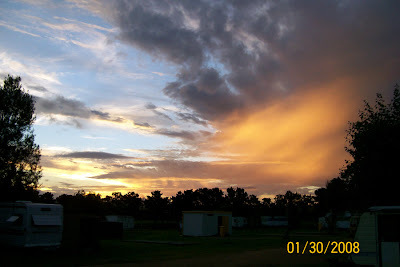 . .
We had another great meal at the RSL club in Manilla and were treated to the sunset in the photo above. We hope to get a good long flight in tomorrow since it will be our last chance before we drive to Sydney on Sunday. Yesterday Dave & I were able to get a short flight in at Mt. Borah. The weather continues to be quite unsettled & a trough promises to bring wet weather to the majority of Eastern Australia. At the moment, there are scattered showers, some with solid rain in Manilla. The forecast for this area is not encouraging. T-Storms with widespread showers are forecast for the next 4 days. I’ve checked the weather forecast for Bright (about 8-10 hours South of Manilla) and am encouraged that partly cloudy skies are forecast for Wed.-Thursday. The plan, as of now, is to head South to Bright in the morning. So here we sit, with pilots from all over the world, in one of the best XC spots with our wings in the bag & a good book in hand. . .
I’ve found a few more photos from our time in Killarney to post - The first is a spectacular sunset display. The photo isn’t enhanced to make it look better – no need. 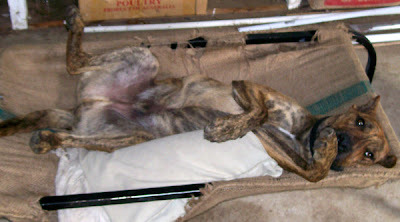 The second is my dog friend Storm relaxing in his hammock. He was the kind of dog that was a clown when he wasn’t tearing stuff up. I hope everybody is enjoying their adventures as much as David & I are. This morning the Killarney skies were overcast & drizzly. David & I decided to head South to Manilla, the site of last year’s worlds championship comp and Ewa’s famous CB tour. The drive took about four hours & we drove through many small towns with names like Barraba, Bingara, and Texas. The drive went quickly and as we proceeded South the weather got progressively more threatening looking. We saw kangaroos, wallabies, fox, and goannas and a host of tropical birds as we travelled the ranches along the road. We pulled into the encampment at Manilla around 2pm. The weather was as you see it in the photo, above. The hill is obvious, with a couple of launches visible from the road. Manilla is Godfrey Wenness’ pet project. He’s spent many months and many $$ to turn this site into a world class flying site. Mt. Borah has four launches, all with Astroturf surfaces. The West launch and the East launch are as large, or larger than a basketball court. We drove to the top of the hill (the peak is 350 meters above the valley floor) and did a tour of the 4 launches. There are expansive setup areas adjacent to each launch. The launches, in some spots, are shallow but all look very good. We have rented a cabin from Godfrey and enjoyed a great night’s sleep last night. Today (Mon.) is overcast with a forecast of rain & isolated T-Storms for the next few days. . . it appears the wx has finally caught up with us. We hope to get some flying here, this week, when the wx allows. Another option is to head to Newcastle & join up with James T. to fly some coastal sites. We got to the hill at 11:30 & things were looking up. The wind was brisk & cloud base low. A 49k task was called but before ordered launch was started, the task was canceled due to rain showers on both sides of the hill. We all flew anyway since the conditions improved as the morning progressed. I ended up in 39th place. I really only flew one task well & got to goal so I didn't deserve to rank any higher that this in a contest of this caliber. The contest has been very enjoyable. The Aussie farmers in the areas we flew always greeted us with a wave when we landed in their fields and the locals in town were friendly and glad to have us. The other pilots were helpful and a gregarious group who understand that the bottom line is winning, but having fun is paramount. My special thanks goes out to James Ryrie & his daughter Hanna, who made the logistics of retrieval easy, and James Thompson who was there to offer advice when asked. 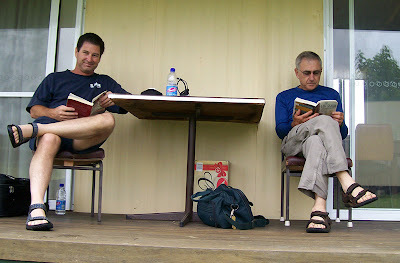 Dave & I are going to fly in Australia for another week, not sure where yet, I'll post any events of note. Today was the best day of the comp. Not only was the weather looking perfect for a good task, with moderate winds from the East-SE, but the thermal activity was forecast to be 3-4 meters/sec. (600-700 fpm) and cloudbase was forecast to be 2200-2500 meters. A 115 Kilometer task was called to a little farming town called Millmerrin with individual starts. Dave got in the air earlier than I did and decided to head over the back early. I launched about 20 minutes after Dave. After launch I went right to cloudbase and waited for a few other gliders to join me so we could head over the back, on course. I pushed out, raring to get some Ks behind me, but a glider behind and left of me turned in a good climb so I backtracked to join him in a climb back to cloudbase. I was feeling very good & liked the conditions as we proceeded along course towards Warwick. From the radio calls, I determined that James T. was about 6 k ahead of me and James R. was behind me about 5k. Dave was out there somewhere, but very quiet. I pushed on & soon Warwick was behind me & I was half way to goal. Today was a good day to get & stay high. The clouds were streeting nicely & I was able to fly for 2-3k without turning & gaining altitude. I spent more time on speedbar today than any prior task. When it began to look like I would make goal I got a little more conservative and worked some lift until I saw 6:1 glide to goal. I pushed full bar & flew the last 6k at 50-60kph but still arrived with 800meters of extra altitude. Making goal, finally, was great. I flew well today & made some good decisions. I flew more conservatively (SLOW) than I needed to, but this assured goal & that was my priority. 114K (71 miles) is my personal best & my time was 3:17 for an average speed of 21+ mph. James T. made goal about 40 minutes before I did. James R. (who was demoing a brand new Avax XC2 (like the one I'll be getting in mid-Feb.) went 22k. but had good things to say about the wing. David got low just past Warwick & went down there. It's Sat. morning, the last day to fly, and it is much more overcast than yesterday. We expect a short task so the party will be well attended tonight.